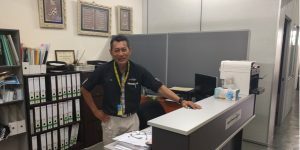 Azmi Shafawi’s vision for Princeton Engineering was truly taking shape – since 2002 the UK-educated civil engineer had built his engineering business into a viable, local Malaysian employer. Five years later the company was established enough to be appointed as a contractor to maintain the runways and taxiways for Kuala Lumpur International Airport (KLIA). Over the years, the company had developed specific expertise that enabled it to consistently win KLIA’s business and extend its contract to 2020. With 35 employees, Princeton was becoming a contributor to local job growth as well as to economic opportunities for women, who serve in management roles for the company. One major challenge Princeton faced was securing timely and reliable cash flow. Although the KLIA contracts provided a steady stream of revenue, payments to Princeton were only made within 60 days of the work being completed. In the meantime, the company had to pay for the materials needed to maintain the runways and cover employee salaries. Princeton had been using funding provided by a leading bank in Malaysia to cover this cash flow gap. However, in 2016 the bank cancelled the offering, leaving Princeton without a means to cover its liquidity needs. This put significant pressure on Princeton: in 2016 alone, KLIA served 52,643,511 passengers and saw 356,614 airplanes use its runways1. That’s a lot of wear and tear, and it requires high quality servicing at a moment’s notice by Princeton employees. Even the slightest delay in Princeton’s payments to its team and suppliers could have had tremendously detrimental effects. This scenario is all too familiar for most small and medium-sized enterprises (SMEs) like Princeton. All over the world, SMEs are widely underserved by traditional lending institutions. Since then, Princeton has been able to stay the course with the help of a factoring facility provided by AGC and its local factor partner in Malaysia, a specialist firm focused on receivables financing. With this facility, Princeton requests payment on approved invoices from our factor partner at a discount; the company then immediately receives the cash it needs and the factor collects full payment of the invoices at the end of their term. By providing invoice discounting and factoring to SMEs like Princeton, AGC and its local factor partners are supporting a virtuous circle of growth and financial inclusion for the ‘missing middle’ of the economic market. Princeton has since been able to invest in diversifying its business by obtaining a concession to operate a highway rest stop. When given properly structured access to working capital, there is tremendous potential for SMEs like Princeton Engineering to sustain their momentum of growth and contribute to a foundation for local economic stability.